For several years it sat behind the garage, dusty, covered with leaves and neglected. The paddles were in the corner of the garage collecting cobwebs. It was an old love supplanted by two new kayaks, with bright colors and sleek bodies. For more than ten years the old green canoe had been my mainstay, but was pushed aside when I researched and wrote The Paddler’s Guide to Michigan. My long, lean yellow sea kayak became my mid-life crisis boat, even though I was more than 60 years old, long past middle age, and had to be pried out of it like a low-slung sports car. My other new boat was a Native Craft fishing kayak that has become my go to boat for most occasions, with its open top and comfortable seat. I can spend an entire day fishing a river out of it or take in exploring in small lakes. But then came a recent Sunday when I wanted to take an afternoon ride, and didn’t want to strap both kayaks on top of my old Jeep. I cleaned off the old canoe, and with some help from my wife, I hosted it on top of the truck, and off I went. When we popped it into a small lake, I rediscovered the joy of canoeing with somebody, the conversations, the slow drifting in shallow areas to watch birds, and most of all at 64, the ease of getting in and out of it. Oh, I know that canoes aren’t as efficient to paddle as kayaks, but there’s something classic and rewarding to the way they paddle. There’s also the effortless beauty you notice in a canoe and not in a kayak. For the time being, the Old Towne is going to stay on top of the Jeep as I rediscover an old love. Funny you should write about "Rediscovering the old canoe". 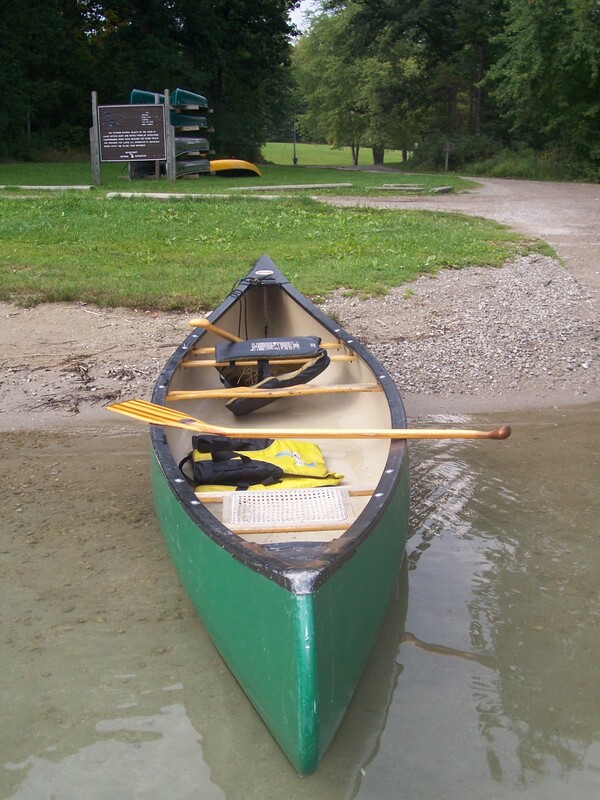 I also have a old green Old Town Canoe that was supplanted by two new kayaks, about 10 years ago. It was then 32, and I much older. Mine has been in a crawl space, also dusty and neglected. I'm planning a trip around the UP this fall and have been thinking of taking it with me, now I know I am. You are so right, there is something classic and rewarding to the way they travel. It makes me wonder how many of my old friends from Mansfield and Rutherford have old green Old Town Canoes that have been neglected. What were they putting in our water back in the early 1950's? Don't take so long between posts, I've enjoyed them all and have been looking forward to this one since January. Oh, and don't lock anyone in a cage. At 64 it could get you into trouble. Sorry it took so long to reply, been out on the water a lot. Hope you have a great fall trip, I'm headed out next week on a photo tour as I've working on revising my Michigan travel book. A great excuse to get out? One tip on U.P. padding, check out Beaver Lake in the Pictured Rocks, a great campground and little water traffic.